29 plays of 25 different games over 6 days can only mean one thing! Yup, it’s BGG Con time. Not only do I get to hang out with some of my favourite people that I only see once a year, but I get to sit and play games for days with no interruption from working in any capacity. 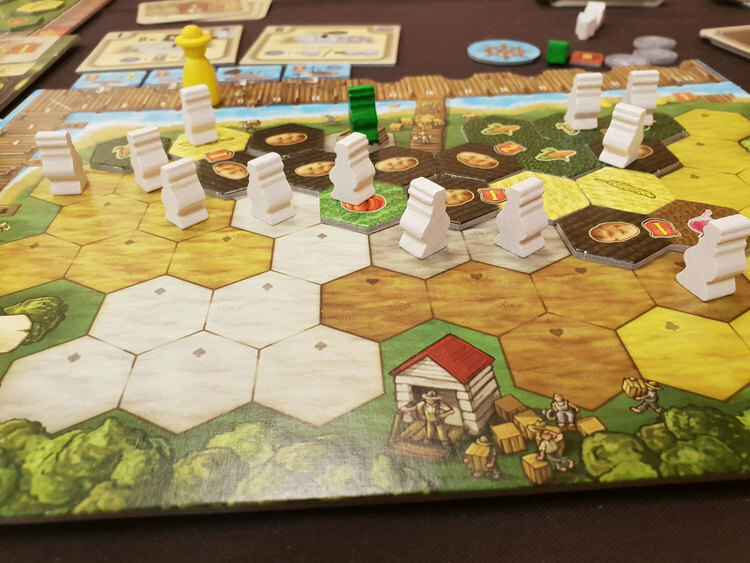 This was my first game of the Con and while I have played Brass: Lancashire, this was new to me and possibly not the best choice after a very long day of travelling combined with time difference! (By the end of the game I had been awake for 26 hours or so!) Needless to say, I did horribly but it reignited my passion for Brass and taught me the new tricks that Birmingham has to offer. This was one of the games I played multiple times over the convention (even teaching it at one point!) I had played this at Tabletop Scotland in September and picked up a copy at Essen a few weeks back so I was keen to play it again. It certainly didn’t disappoint! Card drafting, set collecting, route building and dice rolling all combine to form a pretty unique game that is played over twelve turns meaning every action has to count. 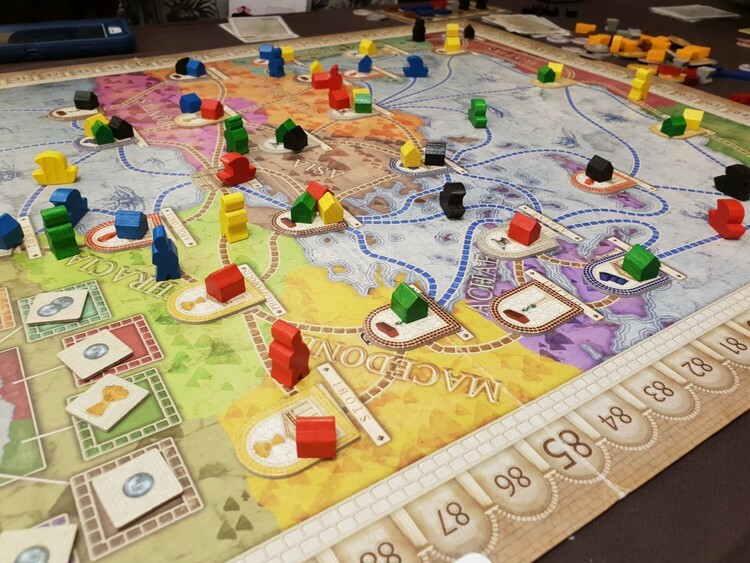 We all know how much I love Concordia and while other people were getting excited over the new Concordia Venus expansion, I found people that had never played Concordia in any form! Of course, it was then my duty to borrow it from the library and teach them. 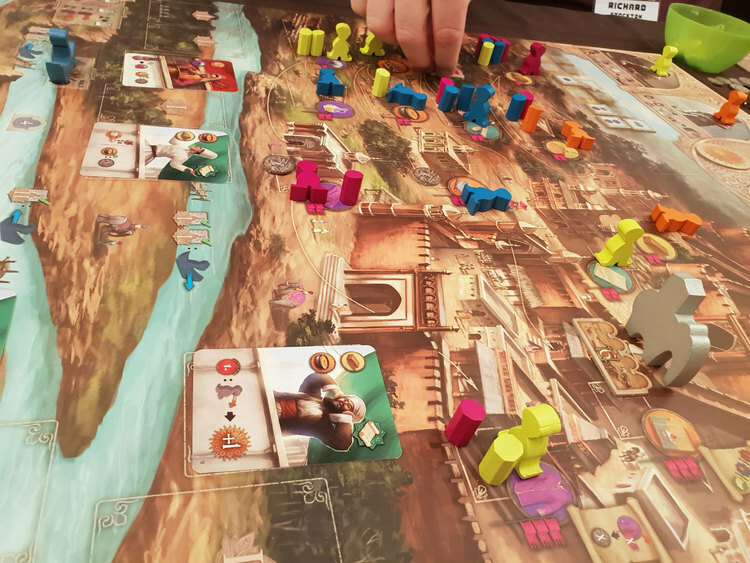 We had an incredibly tight five player game which everyone enjoyed and a copy of Concordia has now joined a new players library - probably the best result possible! What, you thought it was all serious games?! Quite often you will find yourself waiting for someone or having a bit of time to kill. This great dice chucker, push your luck, set collector is fast and fun with adorable art work. My one gripe is that it only takes four players, adding an extra player or two would make it perfect. I did horribly though, finishing the game with two points. More silly games! But this one goes to six. One of my favourite pre-Essen releases of the year. Get rid of your cards before your opponents by blaming their animals for the poo on the carpet! Silly, quick fun with the cutest artwork. There’s also a memory element at work as if you name an animal no one has left, you get stuck with the poo! This is one of those games that is guaranteed to have everyone laughing. 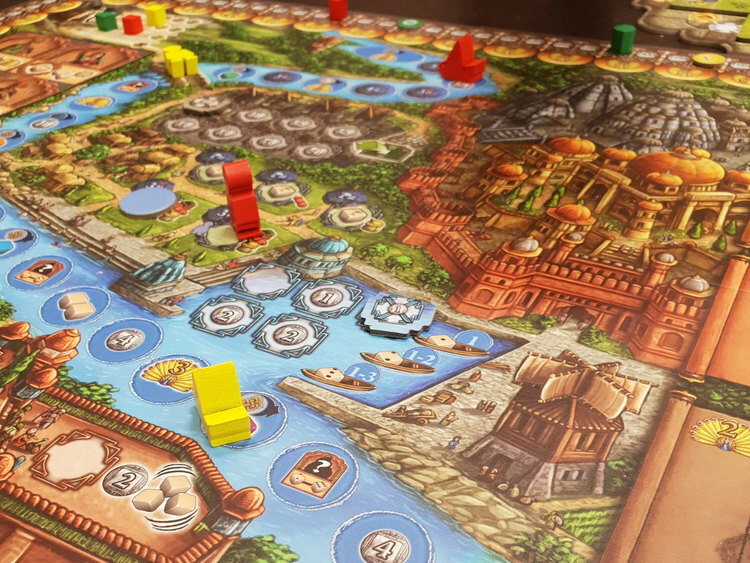 Rajas of the Ganges by HUCH! I played this a while ago and walked away feeling unsure about it, however, I managed to pick it up for a great price over the weekend so was happy to revisit it before bringing it home. After a second play I am glad I now own it. My first play felt like a race game, yes, I know it is a race to get your points and prestige to cross over on the track, but this play felt far more like a proper engine builder and was much more enjoyable. My most played game of my Essen purchases to date! 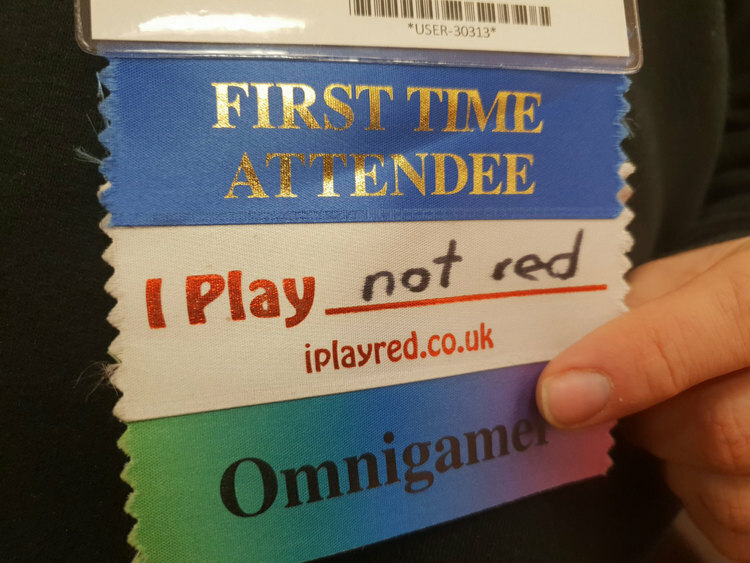 This should be in everyone's convention game bag as it can play an unlimited amount of people which was partly why it got pulled out a few times over the week. Roll and write with no dice? This is being called a flip and fill as your decisions are based around cards that are turned over rather than dice. However, it seems to have a lot more bite than most roll and writes I have played in the past. A long-term favourite of ours and another game I gladly introduced new players to. I remember when I first played and the concept of killing off your workers terrified me as with most worker placement games you want and need more workers. However, once I got my head round that , the concept of different generations of family is very neat and those end game points for the book of remembrance are essential! I’d seen a few people playing this and heard some interesting things so took a chance and bought it as it was small and light weight enough for my luggage! We managed a very rushed game on Sunday afternoon and it didn’t dissapoint! Beautiful artwork and interesting decisions in 30-45 mins gameplay and of course, that great Space Cowboys production. However, the lack of insert does let it down on that front. I played this at Airecon back in March of this year and enjoyed the truly brutal beat down it gave me. So I was happy to jump in on a game, especially as I’ve picked up a copy recently! This is one of those games where there just isn’t time to do everything you want to and the end game comes crashing down on you long before you are ready! So much to do, not enough time and a unique end game scoring means this will be back on the table soon. Confession time - this has been sat on my shelf since Essen last year, so I jumped on the opportunity to finally learn and play it. I’m happy to say it met all my expectations and more. With about an hours teaching time I need to get back to this asap. This had me taking actions one turn knowing my plan wouldn’t come together for another four turns, just the kind of crunchy, deep game I love! This was a prototype game from Bard Games that I’d seen last year at BGG Con. I love seeing how things change and adapt and this was no exception! Beautifully evocative artwork from Amy Brown adds to the experience. Each player draws three cards then passes them to the next player who has to decide if they want the first card or push their luck for something better on the second or third card. Very neat mechanic. Rob is a big fan of deck builders so this has been on our radar a while. It has a very neat mechanic of playing just six cards, then upgrading your deck, buying players that are better and have special abilities. However, being someone who has no interest in sport meant I had no idea what was going on a lot of the time and the card terminology meant nothing to me. I was quite happy to go back to pasted on themes after this sadly! Being that I had muled a copy of this over from Essen, it only seemed right I should teach it! I’m really enjoying this ‘gamers’ version of Azul and again the component quality is beautiful. You can read my full write up on it. I managed to play/teach a few games of this over the week. I have had this in my hand to buy on multiple occasions and something else has always caught my eye so it was great to get a game in. Despite it feeling very clunky at first, once we started playing we were fine and I suspect I shall be picking it up with no hesitation next time I see it! Each round is played over five phases with players taking turns to choose which round they get a bonus in. Thinky but not crunchy! Lotus is another game I’ve written about! I suggested this one with a group who wanted something pretty to play. 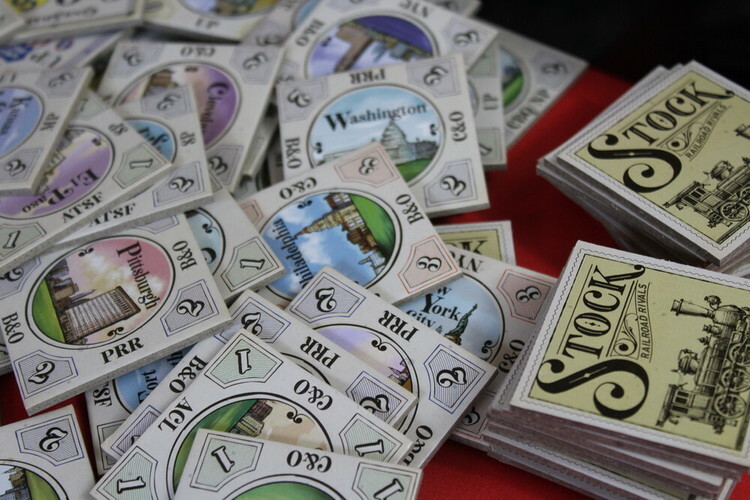 A great little game that combines set collection, area control and hand management that looks gorgeous on the table! I think this ticked all the boxes for the people on the table. Sadly, the rules for this were not good, meaning we were all a couple of rounds in before it clicked with us! 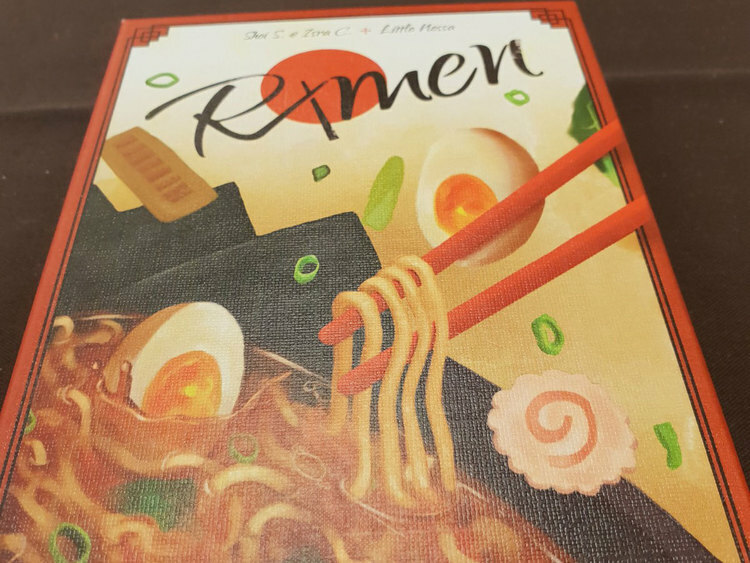 Trick taking card game where you are trying to collect different ingredients to score your best Ramen dish. The theme and art were good but the struggle with the rules left us all a bit confused and hungry for more! Just to prove I don’t buy ALL the games, this is another I have hovered over buying and haven’t. We only played it as a two player and it didn’t really shine but it showed me enough to know this will be great at higher player counts! The attention to detail is stunning with all the book names being different and appropriate to the class of book. Shelf stability and alphabetical order will grant you points, but make sure you don’t have too many banned books on your shelf as they give you negative points. Decide if you want to buy or sell apples, simple enough right? Then, move the farmer round a matrix that adjusts the price of all four apple types (very clever!) However, if someone else wants to sell the same type of apples as you a bidding war takes place and only one person gets to sell. That person was never me and I failed horribly at this game, nearly being lapped on the score track! A great little card game about trying to get your music acts to the top of the charts, I can’t think of another game with this theme (correct me if I’m wrong!) Place a matching card from your hand next to your chosen act, when an act has three cards it’s time for the ‘Hit Parade’ and acts get moved up according to the number of cards next to them. 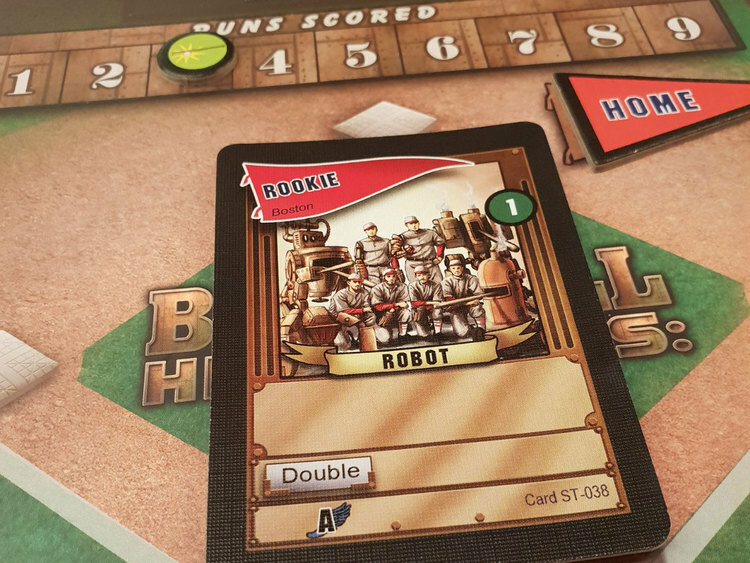 Play continues until the deck is empty and you score points for the cards in your hand according to their final chart position. I’m bad at 18XX games despite enjoying them, therefore I’m always too nervous to play them! So, I bit the bullet and signed up for one this year. I will have forgotten everything I learned during this game before my next 18XX, but a massive thank you for being so patient to my fellow players. 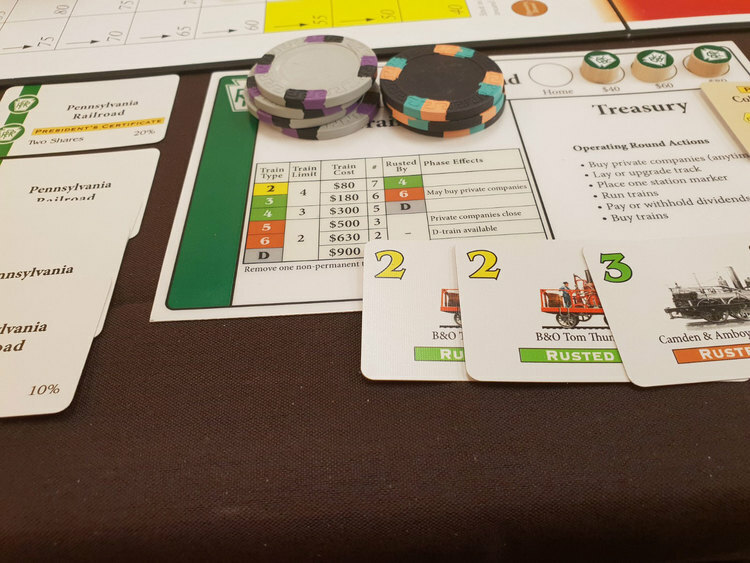 And, yes, I went bankrupt, but it’s all about learning for me! I hate dice games, well, to be fair, dice hate me. That was so evident during this game where I missed out on my first three turns in part due to horrid dice rolls. With a maximum possible dice roll of thirty, I was seeing twelves and elevens. Wager on what you can roll and take cards for points if you are successful, needless to say I wasn’t! This is an older Pegasus Spiel game reprinted this year by Quined games. I really like both publishers so my interest was piqued. Play as master builders competing to build the finest towers (the tiles actually stack beautifully - very satisfying!) You can build multiple towers at one time, however, adding extra tiles will cost you more and if you don’t add to a tower it will become abandoned and drop in size. Lots to think about - totally my kind of game! Count Chocula and friends have a game! Even though we don’t have the cereal I’m a fan! Try to score the highest using your cards, placing extra cards may cost you milk tokens, but scoring highest means you don’t get them. Get rid of your cards before the other players to stop them using and scoring those cards. Not forgetting each monster has its own unique abilities. Silly fun with more thought than I expected for a game about breakfast cereal! So, lots played old and new and I was lucky enough to introduce friends to some of my favourites. 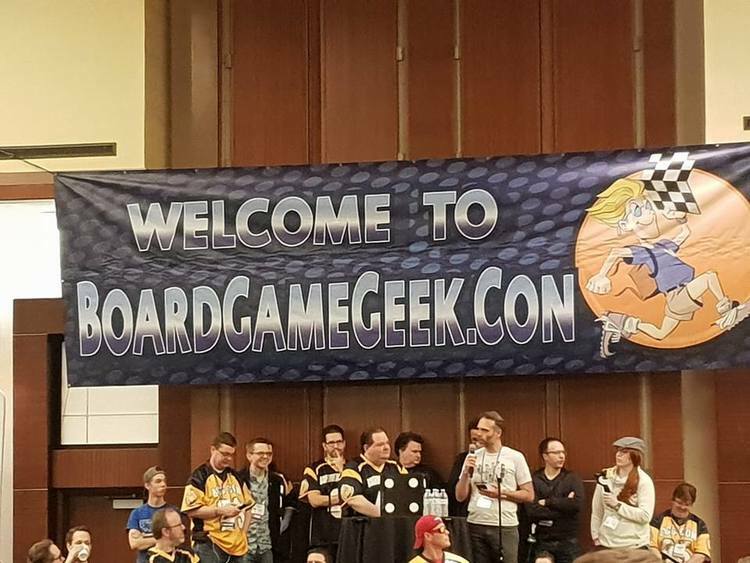 BGG Con is definitely my favourite convention of the year. Is it wrong to already be looking forward to next year?